The River of Ruin is a 1985 Masters of the Universe children’s book written by Bryce Knorr and illustrated by Harry J. Quinn and James Holloway. Here, Skeletor diverts a river and enslaves some peasants to mine a powerful element, and lessons are learned about the power of teamwork. Of the He-Man stories Knorr has written, this is one of his more coherent ones. It often feels like a Filmation episode – I mean that in a good way. That said, there are still a number of cases of Knorr’s trademark small-child-intelligence-insulting writing (e.g., “Snakes are the only thing I like more than doing evil!” –Skeletor, p. 22). There are plot problems, too: how, exactly, Skeletor has the peasants in thrall of a sudden when He-Man and friends have been hanging around there, how the peasants all have the maturity of kindergarteners, and the silly way the Heroic Warriors defeat Spikor (let’s just stick a log on his back!). For the most part, though, the story works well enough, even if it does meander. Likewise, the art from Quinn and Holloway is superior to that in previous books in this line. It’s more consistent throughout, and the characters are generally better proportioned. The shaded coloring is a definite highlight. 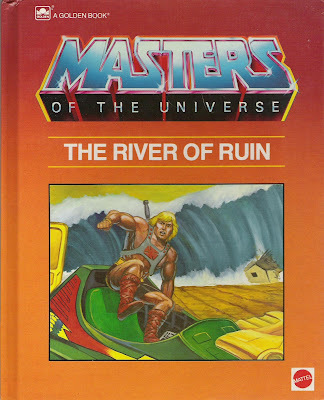 The River of Ruin is the fourth He-Man Golden Hardcover book by Knorr, Quinn, and Holloway, and it’s definitely one of the better ones.